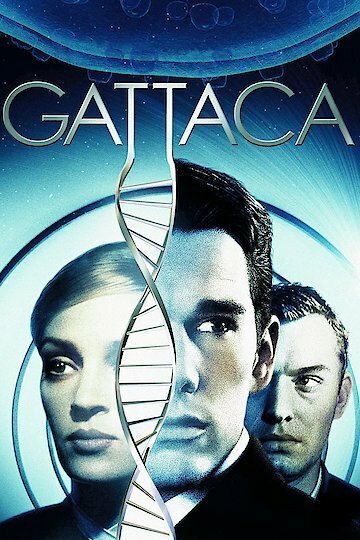 Gattaca focuses on three characters Vincent Freeman played by Ethan Hawke, Jerome Eugene Morrow played by Jude Law, and Irene Cassini played by Uma Thurman. The film has an almost dystopian feel to it as the characters attempt to create relationships and survive in a world dominated by those whose genes, by the manipulation of modern technology, are deemed superior. Vincent Freeman is an intelligent and seemingly attractive male specimen who is denied his life’s dream, space travel. In order to meet his goal, he is willing to achieve his goal, as we learn, by any means possible. Even if these means inevitably leads him to steal the identity of a stranger and genetic superior, Jerome Morrow. Jerome may be Vincent’s genetic superior, but there is one catch. Jerome is a paraplegic as the result of a failed suicide attempt. Jerome was a world class swimmer, and purported to be second to none, until he received a silver medal. Jerome, in his frustration, jumps in front of a car. Though, instead of killing himself, he only succeeds becoming paralyzed from the waist down. As launch of the Gattaca ship, which occurs only every 70 years, approaches, Vincent faces narrow escapes. One of the most surprising is the threat of exposure by his “valid” brother. Anton and Vincent as children would play a game called chicken, where each would swim out as far as they could and the first to turn back would lose. Anton won each time as children, but as young adults Vincent was the winner, and each time after. Vincent even went so far as to save his brother-superior’s life. Before Anton reveals Vincent’s true identity, Vincent challenges him to one last race. It again ends with Vincent’s success and his saving of Anton’s life. Anton asks him his secret. Vincent’s secret, he reveals to his brother after one last swim, is that he never save anything for the swim back. Vincent, deemed genetically “invalid” is the finisher because of determination and character. Vincent boards the ship. Gattaca is currently available to watch free on Crackle and stream, download, buy on demand at Amazon, Vudu, Google Play, iTunes, YouTube VOD online.